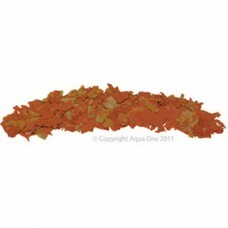 Aqua One Cichlid Flake Food 100gSpecially formulated for smaller species of African and American Cichlids. Top quality ingredients and a good source of protein make this food highly digestible to help reduce fish waste levels. With excellent fish meal, vitamins and minerals content, it will help fish to thrive while promoting good colouration and patterning. Feed on a daily basis to most mid water species.Guaranteed Analysis:Protein: Min 30%Fat: Min 5%Fibre: Max 5%Moisture: Max 10..
Aqua One Cichlid Flake Food 180gSpecially formulated for smaller species of African and American Cichlids. Top quality ingredients and a good source of protein make this food highly digestible to help reduce fish waste levels. With excellent fish meal, vitamins and minerals content, it will help fish to thrive while promoting good colouration and patterning. Feed on a daily basis to most mid water species.Guaranteed Analysis:Protein: Min 30%Fat: Min 5%Fibre: Max 5%Moisture: Max 10..
Aqua One Cichlid Flake Food 24gSpecially formulated for smaller species of African and American Cichlids. Top quality ingredients and a good source of protein make this food highly digestible to help reduce fish waste levels. With excellent fish meal, vitamins and minerals content, it will help fish to thrive while promoting good colouration and patterning. Feed on a daily basis to most mid water species.Guaranteed Analysis:Protein: Min 30%Fat: Min 5%Fibre: Max 5%Moisture: Max 10%..
Aqua One Cichlid Flake Food 52gSpecially formulated for smaller species of African and American Cichlids. Top quality ingredients and a good source of protein make this food highly digestible to help reduce fish waste levels. With excellent fish meal, vitamins and minerals content, it will help fish to thrive while promoting good colouration and patterning. Feed on a daily basis to most mid water species.Guaranteed Analysis:Protein: Min 30%Fat: Min 5%Fibre: Max 5%Moisture: Max 10%..
Aqua One Colour Enhancing Flake Food 24gAll the benefits of our Tropical Flake Food but with the added benefit of spirulina, algae meal, carotene and high fish meal content for healthy fish with vibrant colours and striking patterns. Can be fed daily or occasionally in conjunction with tropical flakes to improve colouring and markings.Suitable for most tropical fish including, Angelfish, Discus, Tetras, Live- bearers and Dwarf Cichlids e.g. Dutch Rams.Guaranteed Analysis:Protein: Min 38%Fat..
Aqua One Colour Enhancing Flake Food 52gAll the benefits of our Tropical Flake Food but with the added benefit of spirulina, algae meal, carotene and high fish meal content for healthy fish with vibrant colours and striking patterns. Can be fed daily or occasionally in conjunction with tropical flakes to improve colouring and markings.Suitable for most tropical fish including, Angelfish, Discus, Tetras, Live- bearers and Dwarf Cichlids e.g. Dutch Rams.Guaranteed Analysis:Protein: Min 38%Fat..
Aqua One Economy Goldfish Flake Food Bulk 1kg..
Aqua One Economy Tropical Flake Food Bulk 1kg..
Aqua One Goldfish Flake 100gDesigned and formulated to be fed on a daily basis. Highest quality ingredients, high in vitamins and minerals help fish to thrive, maintain colours and promote good health. Highly digestible with a good mixture of fish meal and crustacean help reduce waste levels. Suitable for most coldwater species including Goldfish, Shubunkins and small fancy varieties.Guaranteed Analysis:Protein: Min 38%Fat: Min 5%Fibre: Max 5%Moisture: Max 8%Ash: Max 16%Suita..
Aqua One Goldfish Flake 10gDesigned and formulated to be fed on a daily basis. Highest quality ingredients, high in vitamins and minerals help fish to thrive, maintain colours and promote good health. Highly digestible with a good mixture of fish meal and crustacean help reduce waste levels. Suitable for most coldwater species including Goldfish, Shubunkins and small fancy varieties.Guaranteed Analysis:Protein: Min 38%Fat: Min 5%Fibre: Max 5%Moisture: Max 8%Ash: Max 16%Suitab..
Aqua One Goldfish Flake 180gDesigned and formulated to be fed on a daily basis. Highest quality ingredients, high in vitamins and minerals help fish to thrive, maintain colours and promote good health. Highly digestible with a good mixture of fish meal and crustacean help reduce waste levels. Suitable for most coldwater species including Goldfish, Shubunkins and small fancy varieties.Guaranteed Analysis:Protein: Min 38%Fat: Min 5%Fibre: Max 5%Moisture: Max 8%Ash: Max 16%Suita..
Aqua One Goldfish Flake 24gDesigned and formulated to be fed on a daily basis. Highest quality ingredients, high in vitamins and minerals help fish to thrive, maintain colours and promote good health. Highly digestible with a good mixture of fish meal and crustacean help reduce waste levels. Suitable for most coldwater species including Goldfish, Shubunkins and small fancy varieties.Guaranteed Analysis:Protein: Min 38%Fat: Min 5%Fibre: Max 5%Moisture: Max 8%Ash: Max 16%Suitab..
Aqua One Goldfish Flake 52gDesigned and formulated to be fed on a daily basis. Highest quality ingredients, high in vitamins and minerals help fish to thrive, maintain colours and promote good health. Highly digestible with a good mixture of fish meal and crustacean help reduce waste levels. Suitable for most coldwater species including Goldfish, Shubunkins and small fancy varieties.Guaranteed Analysis:Protein: Min 38%Fat: Min 5%Fibre: Max 5%Moisture: Max 8%Ash: Max 16%Suitab..
Aqua One Goldfish Flake Bulk Bucket 1kgDesigned and formulated to be fed on a daily basis. Highest quality ingredients, high in vitamins and minerals help fish to thrive, maintain colours and promote good health. Highly digestible with a good mixture of fish meal and crustacean help reduce waste levels. Suitable for most coldwater species including Goldfish, Shubunkins and small fancy varieties.Guaranteed Analysis:Protein: Min 38%Fat: Min 5%Fibre: Max 5%Moisture: Max 8%Ash: M..
Aqua One Goldfish Flake Bulk Bucket 3.5kgDesigned and formulated to be fed on a daily basis. Highest quality ingredients, high in vitamins and minerals help fish to thrive, maintain colours and promote good health. Highly digestible with a good mixture of fish meal and crustacean help reduce waste levels. Suitable for most coldwater species including Goldfish, Shubunkins and small fancy varieties.Guaranteed Analysis:Protein: Min 38%Fat: Min 5%Fibre: Max 5%Moisture: Max 8%Ash: ..
Aqua One Goldfish Starter PackPack Includes:Goldfish Flake 10gWater Conditioner 50ml..
Aqua One Hermit Crab Flake Food 24gAqua One Hermit Crab food is a complete diet for all land dwelling hermit crab species. Containing a balanced mix of vitamins and mineralsGuaranteed Analysis:Protein: Min 38%Fat: Min 5%Fibre: Max 5%Moisture: Max 8%Ash: Max 16%Suitable for: Hermit..
Aqua One Spirulina Flake Food 100gSpecially formulated for the needs of herbivorous fish especially East African Cichlids and livebearers like Platys, Mollies and Guppies. Made with great quality ingredients plus Spirulina and algae and are high in protein. Highly digestible to lower fish waste levels whilst encouraging fish health, enhance colours and substitute natural foods.Suitable for daily feeding or occasionally alongside Aqua One Tropical Flakes or Micro Pellets.Guaranteed Analysis:Prote..
Aqua One Spirulina Flake Food 24gSpecially formulated for the needs of herbivorous fish especially East African Cichlids and livebearers like Platys, Mollies and Guppies. Made with great quality ingredients plus Spirulina and algae and are high in protein. Highly digestible to lower fish waste levels whilst encouraging fish health, enhance colours and substitute natural foods.Suitable for daily feeding or occasionally alongside Aqua One Tropical Flakes or Micro Pellets.Guaranteed Analysis:Protei..
Aqua One Spirulina Flake Food 52gSpecially formulated for the needs of herbivorous fish especially East African Cichlids and livebearers like Platys, Mollies and Guppies. Made with great quality ingredients plus Spirulina and algae and are high in protein. Highly digestible to lower fish waste levels whilst encouraging fish health, enhance colours and substitute natural foods.Suitable for daily feeding or occasionally alongside Aqua One Tropical Flakes or Micro Pellets.Guaranteed Analysis:Protei..